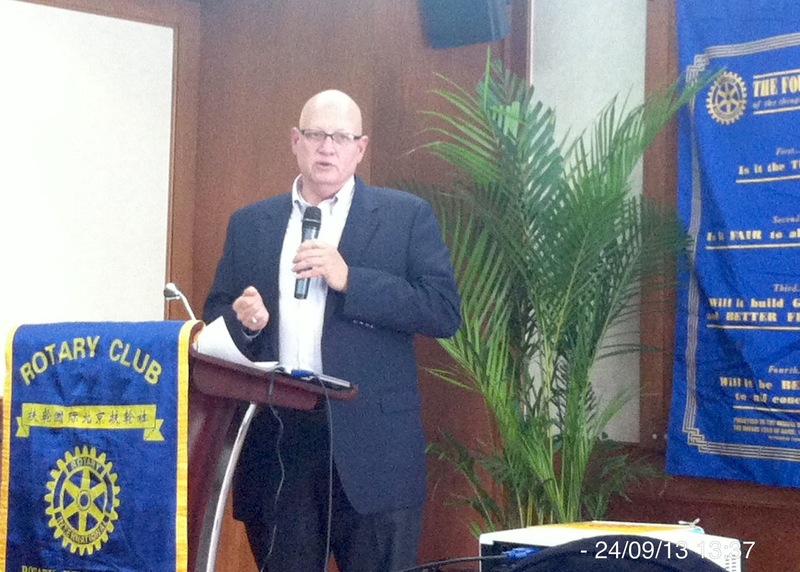 On 24 September 2013 we welcomed James in our Rotary Club of Beijing. Follows his introduction on LinkedIn. James McGregor is an American author, journalist and businessman who has lived in China for more than 25 years. He is chairman of APCO Worldwide, Greater China and a senior advisor to Pacific Epoch. A professional speaker and commentator who specializes in China’s business, politics and society, he regularly appears in the media to discuss China-related topics. He is also a contributor to The Atlantic. From 1987 to 1990 McGregor served as The Wall Street Journal’s bureau chief in Taiwan, and from 1990 to 1994 as the paper’s bureau chief in Mainland China. From 1994 to 2000, he was chief executive of Dow Jones & Company in China. After leaving Dow Jones, he was China managing partner for GIV Venture Partners, a $140 million venture capital fund specializing in the Chinese Internet and technology outsourcing. In 1996, McGregor was elected as chairman of the American Chamber of Commerce in China. He also served for a decade as a governor of that organization. He is a member of the Atlantic Council, Council on Foreign Relations, National Committee on US-China Relations and International Council of the Asia Society. He serves on a variety of China-related advisory boards. He and his family live in Beijing. James gave an eloquent and nicely packaged overview on the present political and business environment in China. Basically I share nearly all of his views. And oh well, he did not say anything I did not know myself (and also talk about in seminars, even in greater detail). But of course I am not “James McGregor”, I am just modest Gilbert. And as we say in Flemish: “You are never a prophet in your own land”. He also referred the study “China 2030” that is covered pretty well in my book Toxic Capitalism. And that was written 18 months ago, and now people talk about it.